Brigadier General Alexander Gore Arkwright Hore-Ruthven, 1st Earl of Gowrie VC, GCMG, CB, DSO & Bar, PC (/ˈhɔːr ˈrɪvɛn/; 6 July 1872 – 2 May 1955) was a British Army officer who served as the tenth Governor-General of Australia, in office from 1936 to 1945. He was previously Governor of South Australia (1928 to 1934) and Governor of New South Wales (1935 to 1936). 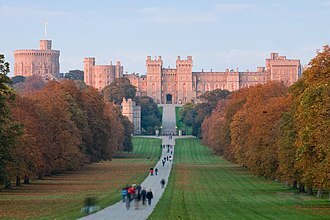 Gowrie was born in Windsor, Berkshire, England, into a minor aristocratic family. He joined a voluntary Yeomanry unit at the age of 17, and then enlisted in the regular army at the age of 19. Gowrie fought in the Sudan during the Mahdist Revolt, and was awarded the Victoria Cross for saving a wounded Egyptian soldier. He later served in the Somaliland Campaign and as an aide-de-camp to the Lord Lieutenant of Ireland. During World War I, Gowrie commanded units in the Gallipoli Campaign and on the Western Front, winning several further honours. He finished his military career with the rank of brigadier-general. In 1928, Gowrie was appointed Governor of South Australia. His handling of political instability during the Great Depression was highly regarded, and when his term expired he was instead appointed Governor of New South Wales. However, Gowrie's second governorship lasted little more than a year, as Joseph Lyons recommended him to become Governor-General. As well as the stresses of World War II, he faced several constitutional challenges, including Lyons' death in office and the defeat of Arthur Fadden's government on a confidence motion. 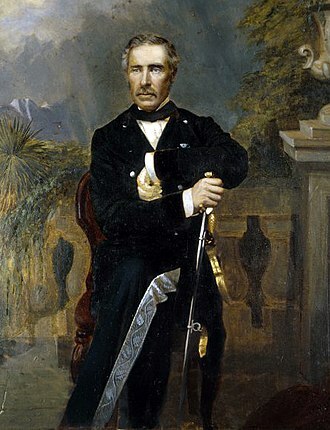 Gowrie's term in office was prolonged as a result of war, and in total he spent nine years in the position, the longest of any governor-general. Alexander Hore-Ruthven was born on 6 July 1872 in Windsor, Berkshire, England, United Kingdom, as the second son of Walter Hore-Ruthven, 1st Baron Ruthven of Gowrie (1838–1921), the 9th Lord Ruthven of Freeland, and Lady Caroline Annesley Gore (1848–1914), the daughter of The 4th Earl of Arran. After attending Winton House School in Winchester (not Winchester College as is stated in some sources) as a boarder from 1884 to 1885, Hore-Ruthven spent most of his early education at Eton College and then Haileybury and Imperial Service College, where he stayed until 1888, when he was withdrawn owing to eyesight problems and sent into business by his parents. He first worked in a tea merchant's office in Glasgow and then traveled to India to work on a tea plantation in Assam. Hore-Ruthven, however, soon succumbed to malaria and he returned to England in 1892. On 19 October 1889, Hore-Ruthven was commissioned a second lieutenant in the Lanarkshire Yeomanry Cavalry. After his return to England in 1892, he then joined the regular army. Following training at the United Services College, he was commissioned on 27 April 1893 as a lieutenant in the 3rd Battalion of the Highland Light Infantry, and was promoted to captain on 18 November 1896. During the Sudan Campaign, he was mentioned in despatches. In May 1899, Hore-Ruthven was also awarded the Order of Osmanieh, Fourth Class, by the Sultan of the Ottoman Empire for his services in the Sudan. On 17 May, he received a regular commission as a second lieutenant in the Queen's Own Cameron Highlanders, dropping back two ranks. In late November, he was part of a Camel Corps during the operations leading to the defeat of the Khalifa (mentioned in despatches 25 November 1899). Promoted to supernumerary lieutenant on 14 December 1900, vice a Lieutenant Murdoch killed in action, he fought in the Somaliland Campaign between 1903 and 1904, and was promoted to a regular lieutenancy on 16 April 1904. In 1905, Hore-Ruthven became an aide-de-camp to Lord Dudley, then Lord Lieutenant of Ireland. Transferring to the 1st (King's) Dragoon Guards in 1908, he was promoted to supernumerary captain in that regiment on 11 April, regaining his former rank after nine years. In 1908, Dudley was appointed Governor-General of Australia, and Hore-Ruthven went with him as military secretary. In the same year he married Zara Pollok, with whom he had two sons, one of whom died in infancy. He left Australia in 1910 and returned to military service in India. He commanded his brigade with conspicuous gallantry and judgment throughout the operations east of Ypres from 28th September to 27th October 1918, inclusive. 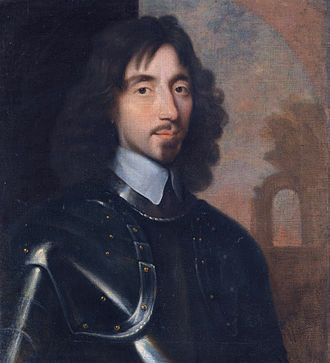 His presence and personal bearing at critical times during the fighting was of decisive value, especially during a strong enemy counter-attack. 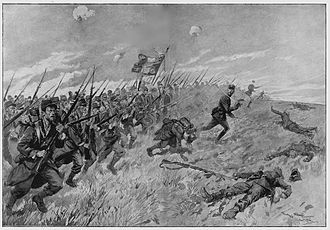 On 20th October, at St. Louis, he went forward among the attacking troops at a critical juncture and inspired them to the final effort, whereby the high ground of great tactical value was captured. He was promoted to the substantive rank of lieutenant colonel on 15 October 1917, and appointed to the general staff as a temporary brigadier-general on 26 December. 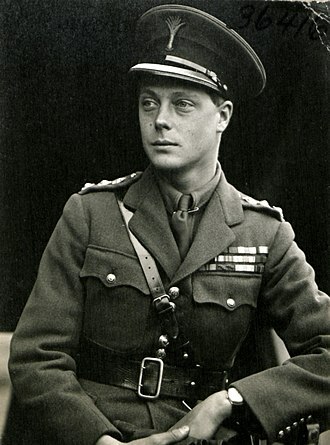 On 1 January 1918, he was appointed a Companion of the Order of St Michael and St George (CMG). He was awarded a Bar to his DSO on 2 April 1919, and appointed a Companion of the Order of the Bath (CB) on 3 June. During the First World War, he served in France and at Gallipoli, where he was severely wounded and mentioned in despatches five times. He finished the war as a brigadier general and commanded British forces in Germany between 1919 and 1920. On 14 December 1920, he was appointed the CO of his regiment, with the temporary rank of colonel, and was promoted to colonel on 5 July 1922 (seniority from 15 October 1921). After this he held various Army staff positions, and received command of a brigade on 1 October 1924 in the temporary rank of colonel-commandant, which had replaced the rank of brigadier-general. when he was knighted as a Knight Commander of the Order of St Michael and St George (KCMG, 24 January 1928) and appointed Governor of South Australia (being sworn in on 14 May 1928). Hore-Ruthven arrived in Adelaide in May 1928. He took to his duties with enthusiasm, visiting many areas of the State in a de Havilland DH.60 Moth owned by his ADC, Captain Hugh Grosvenor. Together with Lady Hore-Ruthven, he was a keen supporter of the Boy Scout and Girl Guide movements. She was also president of the South Australian Red Cross. In a 1930 Anzac Day speech, Hore-Ruthven criticised the union movement for exacerbating, through strike action, the hardship suffered by returned servicemen. He was censured by the United Trades and Labour Council in response. He was on leave in London when the third Bodyline Test cricket match in Adelaide caused Anglo-Australian political tension in 1933, and played a significant part in smoothing relations through his meetings with the British Secretary of State for Dominion Affairs J.H. Thomas. During Hore-Ruthven's second term as governor, the Great Depression was causing severe hardship in South Australia. 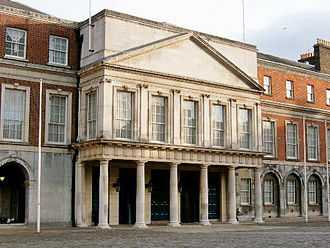 The Lionel Hill government, elected on a promise of bringing a "golden future", was heavily criticised when economic realities forced it to adopt austerity measures. Hore-Ruthven supported Premier Hill in the face of criticism from within the Labor party. His speeches frequently expressed the belief that a premier should "rise above party". 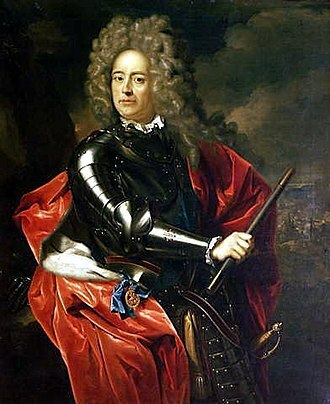 Hill's firm resolve during the crisis was seen as largely the result of Hore-Ruthven's influence. His performance during the crisis was reportedly a critical factor in his subsequent selection as Governor of New South Wales. His term as Governor of South Australia ended in April 1934, and he returned to England. He was almost immediately appointed Governor of New South Wales, and at the suggestion of Prime Minister Joseph Lyons was also raised to the peerage as Baron Gowrie, of Canberra in the Commonwealth of Australia and of Dirleton in the County of East Lothian. He arrived in Sydney on 21 February 1935. However he had already been approached by King George V regarding appointment as Governor-General while in England (after the 2nd Marquess of Linlithgow, son of the inaugural governor-general Lord Hopetoun, declined the post). He was raised to Knight Grand Cross of the Order of St Michael and St George (GCMG) on 20 December 1935. With his military record and experience, Gowrie was seen as an obvious choice to succeed Sir Isaac Isaacs when he retired as Governor-General in 1936. In accordance with established practice Prime Minister Joseph Lyons was offered several alternatives, but Lyons had no intention of recommending another Australian to the post. 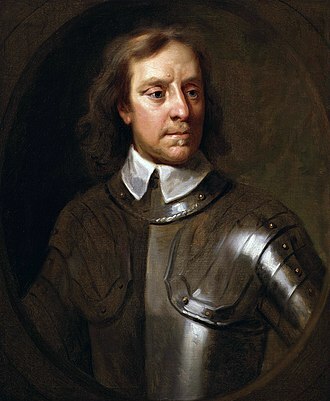 At the time, non-Labor Prime Ministers always appointed British Governors-General. In accordance with Australian constitutional practice, he was formally appointed by King George V, who died on 20 January 1936, three days before Gowrie was due to be sworn in as Governor-General. Thus he came to office during the reign of King Edward VIII. 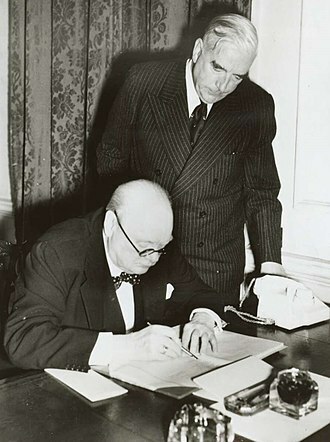 Gowrie signing the declaration of War against Japan with Prime Minister John Curtin looking on. In office, Gowrie was a popular if unobtrusive figure in Australia. The days when Governors-General exercised significant power, or even participated in negotiations between the Australian and British governments, had now passed, but Gowrie set a precedent in 1938 when he toured the Netherlands East Indies at the invitation of the colonial administration. This was the first time that a Governor-General had represented Australia abroad. In April 1939 Lyons died suddenly and Gowrie commissioned Sir Earle Page, the leader of the Country Party, as Prime Minister until the United Australia Party could choose a new leader: this was the only circumstance in which the Governor-General still had some personal discretion. Gowrie's political skills were tested again after the 1940 election, which left the UAP Prime Minister, Robert Menzies, dependent on the votes of two independent members to stay in power. When the UAP forced Menzies out as leader, it was so bereft of leadership that Country Party leader Arthur Fadden was named Prime Minister, even though the UAP was the senior coalition partner. However, the independents were so outraged at how Menzies had been treated that they joined Labor in voting against Fadden's budget and brought the government down. Gowrie was reluctant to call an election for a Parliament just over a year old, especially given the international situation. However, he didn't see another alternative if Labor leader John Curtin didn't have enough support to govern. He therefore summoned the two independents to Yarralumla and made them promise that if he commissioned Curtin as Prime Minister, they would support him and end the instability in government. The independents agreed, and Gowrie duly appointed Curtin. After some initial uneasiness perhaps inevitable with two such contrasting characters, the vice-regal aristocrat and the tough ALP boss got on well. During World War II Gowrie saw it as his duty to support the government and the British Empire, and also the troops. In 1943 he undertook a four-week tour of inspection of Allied Defence Forces in northern Australia and New Guinea. Shortly before undertaking this tour, Gowrie and his wife had learned that their son, Patrick, had been killed in Libya the previous year. He officially opened the Australian War Memorial on 11 November 1941. Gowrie's term ended in September 1944 after which he returned to Britain, where he was created Viscount Ruthven of Canberra, of Dirleton in the County of East Lothian, and Earl of Gowrie and appointed Deputy Constable and Lieutenant-Governor of Windsor Castle. In 1948 he was elected president of the Marylebone Cricket Club. He died in May 1955 at his home in Gloucestershire. He was the only Governor-General of Australia to be advised by five different Prime Ministers (Lyons, Page, Menzies, Fadden and Curtin), although two (Page and Fadden) were short-term appointments. ^ "No. 25985". The London Gazette. 18 October 1889. p. 5505. ^ "No. 26398". The London Gazette. 5 May 1893. p. 2618. ^ "No. 26795". The London Gazette. 17 November 1896. p. 6277. ^ "No. 27031". The London Gazette. 9 December 1898. p. 7969. ^ "No. 27057". The London Gazette. 28 February 1899. p. 1254. ^ "No. 27079". The London Gazette. 12 May 1899. p. 3031. ^ "No. 27080". The London Gazette. 16 May 1899. p. 3104. ^ "No. 27159". The London Gazette. 30 January 1900. pp. 597–600. ^ "No. 27266". The London Gazette. 15 January 1901. p. 313. ^ "No. 27673". The London Gazette. 3 May 1904. p. 2842. ^ "No. 28161". The London Gazette. 24 July 1908. p. 5424. ^ "No. 29117". The London Gazette (Supplement). 30 March 1915. p. 3226. ^ "No. 29565". The London Gazette (Supplement). 2 May 1916. p. 4428. ^ "No. 29469". The London Gazette (Supplement). 8 February 1916. p. 1575. ^ "No. 31680". The London Gazette (Supplement). 9 December 1919. p. 15281. ^ "No. 30444". The London Gazette (Supplement). 21 December 1917. p. 13452. ^ "No. 30511". The London Gazette (Supplement). 5 February 1918. p. 1714. ^ "It's an Honour – Honours – Search Australian Honours". Itsanhonour.gov.au. 8 March 1918. Archived from the original on 29 June 2011. Retrieved 23 July 2011. ^ "No. 30563". The London Gazette (Supplement). 5 March 1918. p. 2971. ^ "No. 31266". The London Gazette (Supplement). 1 April 1919. p. 4316. ^ "No. 31370". The London Gazette (Supplement). 30 May 1919. p. 6789. ^ "No. 32211". The London Gazette (Supplement). 28 January 1921. p. 847. ^ "No. 32245". The London Gazette (Supplement). 1 March 1921. p. 1771. ^ "No. 32726". The London Gazette. 4 July 1922. p. 5034. ^ "No. 32982". The London Gazette. 14 October 1924. p. 7433. ^ Neil Follett (7 July 2011). "Gertrude 'Mac' McKenzie: Forgotten aviation pioneer honoured". Australian Flying. Retrieved 25 April 2013. ^ a b c d Chris Cunneen and Deirdre Morris. "Gowrie, first Earl of (1872–1955)". Australian Dictionary of Biography, National Centre of Biography, Australian National University. Retrieved 25 April 2013. ^ "No. 34273". The London Gazette. 31 December 1935. p. 8402. ^ "No. 36891". The London Gazette. 12 January 1945. pp. 361–362. Wikimedia Commons has media related to Alexander Hore-Ruthven, 1st Earl of Gowrie. Eighteen years of war resulted in the joint-rule state of the Anglo-Egyptian Sudan, a condominium of the British Empire and the Kingdom of Egypt. Following the invasion by Muhammad Ali in 1819, Sudan was governed by an Egyptian administration, because of the heavy taxes it imposed and because of the bloody start of the Turkish-Egyptian rule in Sudan, this colonial system was resented by the Sudanese people. Throughout the period of Turco-Egyptian rule, many segments of the Sudanese population suffered extreme hardship because of the system of taxation imposed by the central government. Under this system, a tax was imposed on farmers and small traders. In bad years, and especially during times of drought and famine, fearing the brutal and unjust methods of the Shaiqiyya, many farmers fled their villages in the fertile Nile Valley to the remote areas of Kordofan and Darfur. The jallaba were known to be slave trading tribes, by the middle 19th century the Ottoman Imperial subject administration in Egypt was in the hands of Khedive Ismail. Thus an ever increasing British role in Egyptian affairs seemed necessary and this commission eventually forced Khedive Ismail to abdicate in favor of his son Tawfiq in 1877, leading to a period of political turmoil. Also in 1873, Ismail had appointed General Charles Chinese Gordon Governor of the Equatorial Provinces of Sudan, for the next three years, General Gordon fought against a native chieftain of Darfur, Al-Zubayr Rahma Mansur. Upon Ismails abdication in 1877, Gordon found himself with dramatically decreased support, exhausted by years of work, he resigned his post in 1880 and left early the next year. His policies were soon abandoned by the new governors, but the anger, another widely reported potential source of frustration was the Turco-Egyptian abolition of the slave trade, one of the main sources of income in Sudan at the time. In the 1870s, a Muslim cleric named Muhammad Ahmad preached renewal of the faith and liberation of the land, soon in open revolt against the Egyptians, Muhammad Ahmad proclaimed himself the Mahdi, the promised redeemer of the Islamic world. In August 1881 the then-governor of the Sudan, Raouf Pasha, the captains of the two companies were each promised promotion if their soldiers were the ones to return the Mahdi to the governor. Both companies disembarked from the steamer that had brought them up the Nile to Aba Island, arriving simultaneously, each force began to fire blindly on the other, allowing the Mahdis scant followers to attack and destroy each force in turn at the Battle of Aba. The Mahdi began a retreat to Kordofan, where he was at a distance from the seat of government in Khartoum. This movement, couched as a progress, incited many of the Arab tribes to rise in support of the Jihad the Mahdi had declared against the Turkish oppressors. Another Egyptian expedition dispatched from Fashoda was ambushed and slaughtered on the night of 9 December 1881, the Mahdi legitimized his movement by drawing deliberate parallels to the life of the Prophet Muhammad. He called his followers Ansar, after the people who greeted the Prophet in Medina, and he called his flight from the British, the hijrah, after the Prophets flight from the Quraysh. Sir Isaac Alfred Isaacs GCB, GCMG, KC was an Australian judge and politician who served as the 3rd Chief Justice of Australia and the 9th, and first Australian-born, Governor-General. He had previously served as Attorney-General in the Protectionist government of Alfred Deakin, Isaacs was the son of Alfred Isaacs, a tailor of Jewish ancestry from the town of Mława, Poland. Seeking better prospects, Alfred left Poland and worked his way across what is now Germany, spending months in Berlin. By 1845 he had passed through Paris and arrived to work in London, where he met Rebecca Abrahams, after news of the 1851 Victorian gold rush reached England, Australia became a very popular destination and the Isaacs decided to emigrate. By 1854 they had saved enough for the fare, departing from Liverpool in June 1854, some time after arriving the Isaacs moved into a cottage and shopfront in Elizabeth Street, where Alfred continued his tailoring. Isaac Alfred Isaacs was born in this cottage on 6 August 1855 and his family moved to various locations around Melbourne while he was young, in 1859 moved to Yackandandah in northern Victoria, close to family friends. At this time Yackandandah was a mining settlement of 3,000 people. Isaacs had siblings born in Melbourne and Yackandandah, who became a solicitor and Victorian Member of Parliament. A brother was born in Melbourne, and another sister was born in Yackandandah and his first formal schooling was from sometime after 1860 at a small private establishment. At eight he won the school arithmetic prize, winning his photograph by the schoolmaster, Yackandandah state school was opened in 1863 and Isaacs enrolled as a pupil. Here he excelled academically, particularly in arithmetic and languages, though he was a frequent truant, to help Isaacs gain a better quality education, in 1867, his family moved to nearby Beechworth first enrolling him in the Common school in the Beechworth Grammar School. He excelled at the Grammar School, becoming dux in his first year, in his second year he was employed part-time as an assistant teacher at the school, and took up after school tutoring of fellow students. In September 1870, when Isaacs was just 15 years old, he passed his examination as a pupil teacher, Isaacs was next employed as an assistant teacher at the Beechworth State School, the successor to the Common school. The peninsula forms the northern bank of the Dardanelles, a strait that provided a sea route to the Russian Empire, one of the Allied powers during the war. 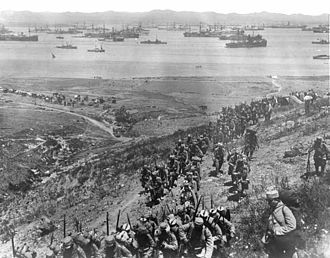 Intending to secure it, Russias allies Britain and France launched an attack followed by an amphibious landing on the peninsula. The naval attack was repelled and after eight months fighting, with casualties on both sides, the land campaign was abandoned and the invasion force was withdrawn to Egypt. The campaign was one of the greatest Ottoman victories during the war, in Turkey, it is regarded as a defining moment in the nations history, a final surge in the defence of the motherland as the Ottoman Empire crumbled. In 1908, a group of officers, known as the Young Turks. The new régime implemented a program of reform to modernise the political and economic system. 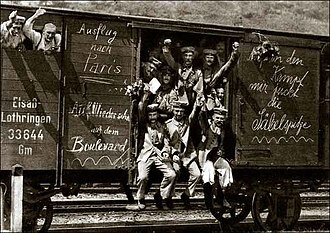 An enthusiastic supporter, Germany provided significant investment, German diplomats subsequently found increasing influence, despite Britain previously being the predominant power in the region, while German officers assisted in training and re-equipping the army. 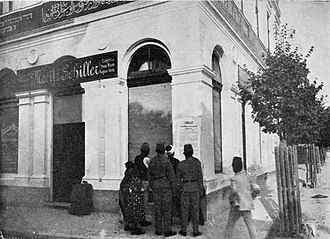 Despite this support, the resources of the Ottoman Empire were depleted by the cost of the Balkan Wars of 1912 and 1913. In December 1913, the Germans sent a mission to Constantinople. The geographical position of the Ottoman Empire meant that Russia and her allies France, during the Sarajevo Crisis in 1914, German diplomats offered Turkey an anti-Russian alliance and territorial gains in Caucasia, north-west Iran and Trans-Caspia. The pro-British faction in the Cabinet was isolated due to the British ambassador taking leave until 18 August, as the crisis deepened in Europe, Ottoman policy was to obtain a guarantee of territorial integrity and potential advantages, unaware that the British might enter a European war. This action strained diplomatic relations between the two empires and the German government offered SMS Goeben and SMS Breslau to the Ottoman navy as replacements, by allowing the German ships to enter the Dardanelles, the Ottomans confirmed their links to Germany. In September, the British naval mission to the Ottomans, which had established in 1912 under Admiral Arthur Limpus, was recalled due to increasing concern that Turkey would soon enter the war. Joseph Aloysius Lyons, CH was the tenth Prime Minister of Australia, serving from January 1932 until his death. He had earlier served as Premier of Tasmania from 1923 to 1928, Lyons was born in Stanley and was a schoolteacher and trade unionist before entering politics. He was elected to the Tasmanian House of Assembly in 1909, representing the Labor Party, Lyons was elected party leader after the Labor governments defeat at the 1916 state election. He became premier in October 1923, after Walter Lee lost a no-confidence motion, elected to the Division of Wilmot at the 1929 federal election, Lyons was immediately made a minister in the new government formed by James Scullin. However, he resigned from cabinet in January 1931 over a policy dispute and he and several other Labor defectors subsequently helped to form the new United Australia Party, which elected Lyons as its leader. The UAP won government at the 1931 federal election, and was re-elected in 1934 and 1937, Lyons died of a heart attack in April 1939, becoming the first prime minister to die in office. His widow, Enid Lyons, became the first woman elected to the House of Representatives, Lyons was born in Stanley, the grandson of Irish immigrants. His father, Michael Lyons, was a farmer who afterwards engaged in a butchery and bakery business, but lost this on account of bad health. His mother did much to keep the family of eight children together, but with the assistance of two aunts, he was able to resume his education at the Philip Smith Teachers Training College and became a teacher. He became a trade unionist and was an early member of the Australian Labor Party in Tasmania. In 1909 Lyons was elected to the Tasmanian House of Assembly for Wilmot in central Tasmania, from 1914 to 1916 he was Treasurer and Minister for Education and Railways in John Earles state Labor government. As Education Minister he oversaw a number of reforms, including abolition of fees for schools, improving teachers pay and conditions. In 1913, a participant in the Labor discussion groups, Eliza Burnell, introduced him to her 15-year-old daughter, Enid Burnell and she was a strong-minded woman who exercised great influence over Lyons, while raising their eleven children. Sir George Tom Molesworth Bridges, KCB, KCMG, DSO known as Sir Tom Bridges, was a British military officer and Governor of South Australia. After the First World War, he served in Greece, Russia and he was Governor of South Australia from 1922–27. Bridges was born at Park Farm, Kent, England, to Major Thomas Walker Bridges and he was educated at Newton Abbot College and at the Royal Military Academy, Woolwich. After graduating from the Royal Military Academy, Bridges joined the Royal Artillery as a lieutenant on 19 February 1892. He was promoted to lieutenant on 19 February 1895, and received the rank of captain supernumerary to the establishment on 5 April 1900, serving in the Second Boer War in South Africa, for a few months in 1901 he commanded two West Australian Mounted infantry contingents. In 1908, he became the instructor at the Cavalry School at Netheravon. Seeking a more rapid promotion in the army, Bridges transferred to the 4th Queens Own Hussars in 1909 and he was appointed military attaché to the Low Countries and Scandinavia between 1910 and 1914. Early in World War I, Bridges was involved in the Battle of Mons, during the British Armys retreat, he met two battalions of exhausted British soldiers at Saint Quentin, whose officers planned to surrender to save the town from bombardment. In a celebrated incident on 27 August, the injured Bridges used a tin whistle and toy drum purchased from a toy shop to rally the men, in October, French flew Bridges to the besieged Belgian city of Antwerp to provide intelligence there for the British headquarters. In 1916 he was promoted to major general and he set about turning the 19th Division into an efficient fighting unit, purging the senior officers. 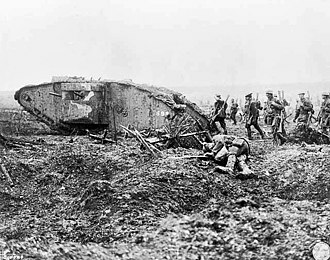 The division was in reserve on the disastrous first day of the Battle of the Somme and it acquitted itself well in the small subsequent attacks around La Boiselle in July. In 1917, Bridges was sent on the liaison to the United States under Arthur Balfour, soon after the Americans entered the war. This caused much friction as the American general staff felt that US troops should be commanded by US officers, Bridges returned in time to lead his division at Passchendaele in 1917. Instituted on 6 September 1886 by Queen Victoria in a Royal Warrant published in the The London Gazette on 9 November, the first DSOs awarded were dated 25 November 1886. It is typically awarded to officers ranked major or higher, during the First World War,8,981 DSOs were awarded, each award being announced in The London Gazette. The order was established for rewarding individual instances of meritorious or distinguished service in war, after 1 January 1917, commanders in the field were instructed to recommend this award only for those serving under fire. Prior to 1943, the order could be only to someone mentioned in despatches. The order is given to officers in command, above the rank of captain. 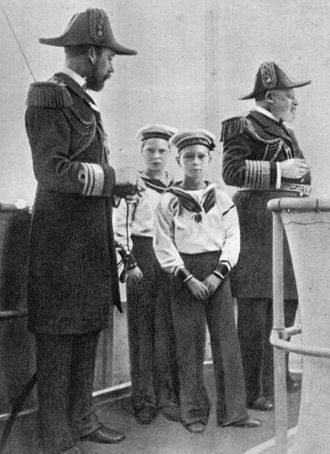 A number of junior officers were awarded the DSO. In 1942, the award of the DSO was extended to officers of the Merchant Navy who had performed acts of gallantry while under enemy attack. Since 1993, its award has been restricted solely to distinguished service and it has, despite some very fierce campaigns in Iraq and Afghanistan, remained an officers-only award and it has yet to be awarded to a non-commissioned rank. Recipients of the order are known as Companions of the Distinguished Service Order. They are entitled to use the post-nominal letters DSO, one or more gold medal bars ornamented by the Crown may be issued to DSO holders performing further acts of such leadership which would have merited award of the DSO. The bars are worn as clasps on the ribbon of the original award. The medal signifying its award is a cross, enamelled white. In the centre, within a wreath of laurel, enamelled green, is the crown in gold upon a red enamelled background. On the reverse is the royal cypher in gold upon a red enamelled ground, within a wreath of laurel, a ring at the top of the medal attaches to a ring at the bottom of a gold suspension bar, ornamented with laurel. At the top of the ribbon is a gold bar ornamented with laurel. The red ribbon is 1.125 in wide with blue edges. The medals are issued unnamed but some recipients have had their names engraved on the reverse of the suspension bar, the bar for an additional award is plain gold with an Imperial Crown in the centre. Shipton Moyne is a village and civil parish in the Cotswold district, England located approximately 105 miles west of London. 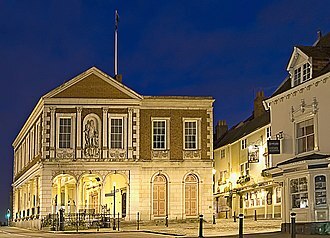 Its nearest towns are Tetbury, in Gloucestershire and Malmesbury in Wiltshire, the population taken at the 2011 census was 265. British History Online provides an account of the history of the village from the eleventh to the twentieth century. The Fosse Way forms part of the boundary and the county boundary with Wiltshire. Shipton Moyne was one of several parishes which were transferred from Wiltshire to Gloucestershire in 1930, in 1661 two parishioners were keeping unlicensed alehouses and in 1755 two victualers were licensed. A beerhouse on the west side of the street was recorded in the early 19th century and was presumably occupied by the beer-retailers listed in the parish later. Apparently still unnamed in 1891, it was called the Estcourt Arms in 1927 but by 1931 the name had changed to the Cat. The village pubs unusual name is said to originate from the book Handley Cross or Mr Jorrockss Hunt by R S Surtees, the full text of which may be found here. A South aisle was constructed with a new tower at the South West corner forming a belfry, alexander Hore - Ruthven, 1st Lord Gowrie and his wife are both buried in St. John the Baptist churchyard. Lord Gowrie was the 20th Governor of South Australia from 15/05/1928 to 26/04/1934, from 15/01/1935 to 23/01/1936 he was the 27th Governor of New South Wales and from 23/01/1936 to 30/01/1945 he was Governor General of Australia. To date the governor general. The list of rectors goes back to 1297e, in the 19th century the church was served by Curates, the former church is recorded in engravings and photographsor. There is an account of the church in the Victoria County History, Shipton Moyne, Church, A History of the County of Gloucester, Volume 11, Bisley and Longtree Hundreds, T. H. Wyatt was a cousin of the architects James and Jeffrey Wyatt. T. H. Wyatt was an eminent architect and had a practice that included work on many Wiltshire churches owing to his patronage by the Beauforts. His design of St.
Sir Robert Gordon Menzies, KT, AK, CH, PC, QC, FAA, FRS, was the Prime Minister of Australia from 1939 to 1941 and again from 1949 to 1966. He is Australias longest-serving prime minister, serving over 18 years in total, Menzies studied law at the University of Melbourne and became one of Melbournes leading lawyers. 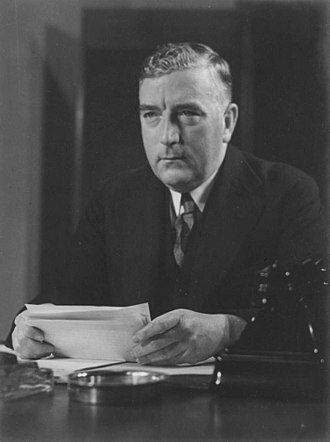 He was Deputy Premier of Victoria from 1932 to 1934, and transferred to federal parliament, subsequently becoming Attorney-General, in April 1939, following Lyons death, Menzies was elected leader of the United Australia Party and sworn in as prime minister. He authorised Australias entry into World War II in September 1939, on his return to Australia in August 1941, Menzies found that he had lost the support of his party and consequently resigned as prime minister. He subsequently helped to create the new Liberal Party, and was elected its leader in August 1945. At the 1949 federal election, Menzies led the Liberal–Country coalition to victory, after 1955, his government received support from the Democratic Labor Party, a breakaway group from the Labor Party. Menzies won seven consecutive elections during his term, eventually retiring as prime minister in January 1966. Robert Gordon Menzies was born to James Menzies and Kate in Jeparit and he was the fourth of six children, with one sister and three brothers. His maternal grandfather, John Sampson, was a Cornish miner from Penzance who came to seek his fortune on the goldfields and his father was elected to the Victorian State Parliament for the seat of Lowan in 1911 and moved with the family to Melbourne after selling the farm. His middle name, was given to him in honour and memory of Charles George Gordon, Menziess formal education began at Humffray Street State School in Bakery Hill, later at private school in Ballarat. He attended Wesley College in Melbourne and studied law at the University of Melbourne, when World War I began, Menzies was 19 years old and held a commission in the universitys militia unit. 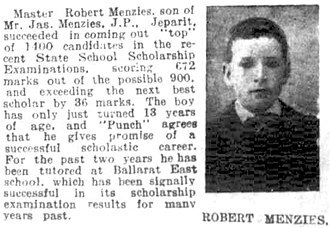 He resigned his commission at the very time others of his age and it was stated that, since the family had made enough of a sacrifice to the war with the enlistment of two of three eligible brothers, Menzies should stay to finish his studies. The obverse of William Johnstone's VC showing the dark blue ribbon for pre-1918 awards to naval personnel. Victoria Cross as it appears on Commonwealth War Graves Commission headstones. Viscount Dunrossil, 14th Governor-General of Australia (1960–61), in his court uniform, with his vice-regal consort, Viscountess Dunrossil. 1970 Rolls-Royce Phantom VI limousine, the official car used on ceremonial occasions to transport the Governor-General of Australia and visiting heads of state. Isaacs in the 1898 Australasian Federal Convention album. Ribbon ceremony to open the Sydney Harbour Bridge on 19 March 1932. Premier Lang cuts the ribbon while Game looks on. 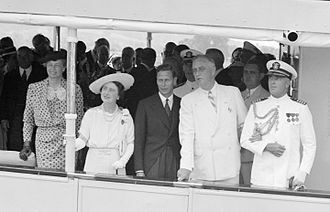 Sir Philip and Lady Game are farewelled by Premier Stevens on board RMS Niagara, upon their departure on 15 January 1935. Commissioner Game (left) with the Duke and Duchess of Gloucester at Euston Station on the eve of their departure for Australia in 1945. Sir Philip Game in 1930 wearing his 1920 pattern RAF Full Dress uniform. This banner is a declaration of faith and allegiance into Allah, and was carried into battle by the Sudanese Mahdist Army. The color of the banner identifies the fighting unit. From Omdurman, 1898. The Kelvingrove Art Gallery and Museum, Glasgow, UK. Given by Miss Victoria MacBean, 1929. A collection of photographs from the campaign. From top and left to right: Ottoman commanders including Mustafa Kemal Atatürk (fourth from left); Allied warships; V beach from the deck of SS River Clyde; Ottoman soldiers in a trench; and Allied positions. French troops land at Lemnos, 1915. British camel troopers in 1913, between Berbera and Odweyne in British Somaliland. The Lord Lieutenant of Ireland was the ex officio Grand Master of the Order of St Patrick (uniform shown here worn by William Ward, 2nd Earl of Dudley, Lord Lieutenant from 1902 to 1905). Premier Bertram Stevens (left) at a polling place in Croydon on 13 May 1935. Stevens with members of his cabinet in 1939. Anderson entertaining Ramsay MacDonald (seated, left), Prime Minister of the United Kingdom, at Government House in August 1934.